Jaguar unveiled a mildly tweaked 2008 S-Type at the Bologna Motor Show today to what we imagine could only be a reaction of complete indifference. As we reported earlier, the S-Type’s replacement will be called the XF and be a much better car in every way compared to its predecessor, which makes a refreshened S-Type for 2008 a big snore. The changs for 2008 include disseminating the racier S-Type R’s bumper and mesh grille across the entire range, as well as what appear to be smoked lenses for the headlights. 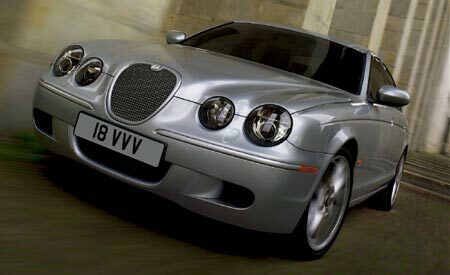 The latter could’ve already been on the S-Type, as we have to admit we haven’t stared one down in a while. New wheels are also being offered, including a 19-inch set called “the Barcelona” on the S-Type R.
The interior also gets upgraded for 2008 with new seats and non-perforated leather, and the six-speed auto is now standard across the line. There are now only four trim levels for the UK-spec S-Type that include the Spirit, XS, SE and R. The good news is that the R model’s price has been reduced by over Â£5,000. 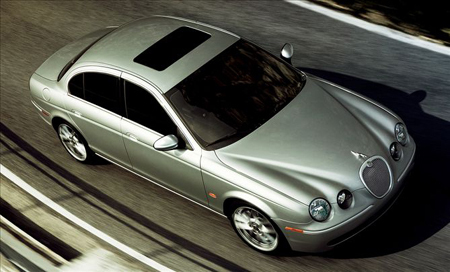 The 2008 Model Year Jaguar S-TYPE revealed today at the Bologna Motor Show now offers customers even better value for money, with specification enhancements and reduced prices on a number of models. The S-TYPE continues to be respected and admired by customers throughout the world. At an emotional level, S-TYPE owners are attracted by its individuality, iconic design and sporting performance. But there are also a host of rational reasons why buying an S-TYPE makes sense. A range of three engines â€“ from the acclaimed twin-turbo V6 Jaguar diesel engine that offers impressive performance alongside outstanding fuel economy, through to the mighty 4.2-litre supercharged V8 â€“ and the availability of manual and automatic transmissions gives S-TYPE customers a choice of rewarding powertrains. 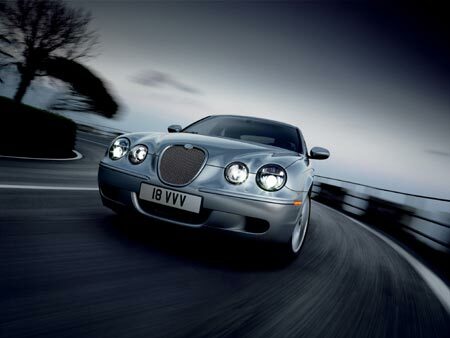 Every S-TYPE has a broad equipment specification, including many of Jaguar’s latest technical features, and of course craftsmanship and quality are high on the list of attributes. 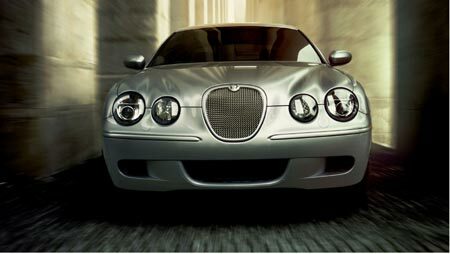 For the 2008 Model Year, all S-TYPEs gain the sporting S-TYPE R bumper and mesh grille. The new look at the front is both contemporary and more dynamic, giving every model a more poised and powerful appearance. An upgraded range of alloy wheels adds to the sporting appearance of the 2008 Model Year cars. A multi-spoke 17-inch Antares wheel is now standard on the least expensive models, while all SE versions now feature the 18-inch Triton alloy wheel. The highly successful Limited Edition XS model has also replaced the existing S-TYPE Sport model with a dynamic Exterior Styling Pack, Sport interior and 18-inch Mercury wheels. At the top-of-the-range, the S-TYPE R now comes with a stunning 19-inch wheel â€“ the Barcelona â€“ as standard. The S-TYPE’s interior is also upgraded, with the introduction of multi-function seats with non-perforated leather in a more contemporary style instead of the previous Classic seat for all SE models. The entry-level cars now come with Jaguar’s acclaimed six-speed automatic transmission, leather seats and a leather-trimmed steering wheel as standard, while a new Satin Mahogany veneer is available as an option across the range (excluding XS). Choice is further extended with the availability of a new Ivory and Charcoal leather colour combination for SE models. With technical excellence and innovation very much part of the S-TYPE’s appeal, Rear Park Assist has become standard on all models. Enhancements to the S-TYPE product range in the UK simplify the line-up to four trim levels, all offering customers improved value-for-money: the Spirit, XS, SE and ‘R’. S-TYPE Spirit (2.7 diesel and 3.0 petrol) â€“ The new entry to the range will be the 2.7 diesel and 3.0 petrol Spirit models. These cars feature 8×6 way leather seats and automatic transmission as standard in addition to the other changes being made to the whole range. Importantly the 08MY S-TYPE Spirit models also feature a Â£1,000 price reduction and offer outstanding value with diesel prices starting at under Â£30,000 and petrol prices below Â£29,000. S-TYPE XS (2.7 diesel and 3.0 petrol) â€“ The highly successful XS model replaces the existing S-TYPE Sport. The 3.0 petrol XS is based upon the 08MY 3.0 Spirit and includes automatic transmission, SE steering wheel and reverse park control as standard. Additional standard features include 18-inch Mercury Alloy wheels, an Exterior Styling Pack displaying a stylish front spoiler with fog lamps, perforated leather sports seats, sports interior theme, de-chromed bumpers and sports suspension. The 2008 model year S-TYPE 3.0 XS will be priced at Â£31,995. The specification of this car also includes automatic transmission as standard. A 2.7 diesel XS with identical specification is also offered, priced at Â£32,995. 18-inch Triton wheels, 10×8 leather seats and rain sensing wipers, as well as the bumper and grille enhancements being applied to the whole range. Pricing at Â£33,495 (3.0 litre) and Â£34,495 (2.7 diesel) is Â£455 more than the prior model year. S-TYPE R (4.2 litre supercharged V8) â€“ Following the success of a similar change on XJR at 07MY, the flagship S-TYPE R derivative has been repositioned. This range-topping model offers increased value through the fitment of 19-inch Barcelona wheels as standard. More significantly the on-the-road price is reduced to Â£45,000 (from Â£50,040). This lower price further reinforces the car’s outstanding value. 2.7 diesel S and 3.0 petrol S models, 2.7 diesel and 3.0 petrol Sport derivatives and all naturally aspirated 4.2 V8 engine derivatives. S-TYPE 08MY sees Jaguar Racing Green replaced with new Emerald Fire. All other exterior colours remain unchanged. In summary, S-TYPE 08MY provides a series of specification enhancements and significantly simplifies the range. Together with important price reductions (in particular to the Spirit and ‘R’ models) and the continuation of the successful XS model, these changes deliver an excellent value-for-money proposition for customers.